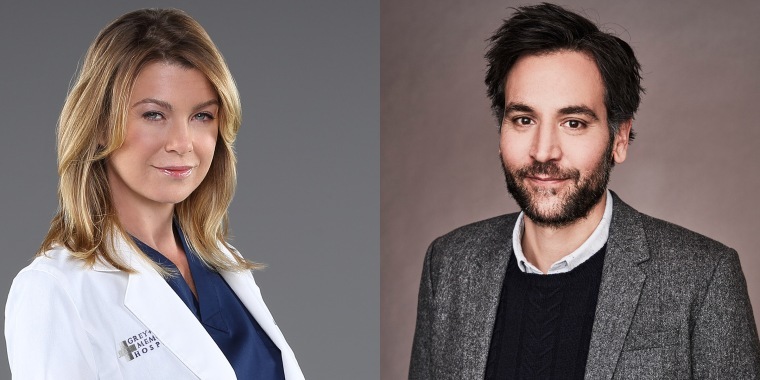 The actor, known to millions as Ted Mosby, is set to play the love interest of romance-starved Meredith Grey. If things go right for Josh Radnor on his latest role, he will have a character who will be able to tell a fresh new set of kids how he met their mother. The actor will appear on "Grey's Anatomy" as a potential love interest to Meredith Grey (Ellen Pompeo) in Thursday night's episode, TODAY has confirmed. How many episodes of the long-running drama Radnor will be in remains unclear, according to The Hollywood Reporter. The character played by the 44-year-old heartthrob may be the prescription for the decidedly sickly love life endured by Dr. Grey ever since a fatal car accident claimed the love of her life — her husband, Dr. Derek Shepherd, a.k.a. McDreamy, famously played by Patrick Dempsey. But that awful luck may be changing courtesy of a blind date with Radnor's mysterious eligible bachelor. It's clearly been a long time, a point mined for a little comedy in a clip released to People ahead of the episode. “What happened? Are you going to a funeral?,” Grey's sister-in-law, Dr. Amelia Shepherd (Caterina Scorsone), says after spying Meredith in a tan trenchcoat ahead of the blind date. Radnor, of course, is best known for playing Ted Mosby — better known as the "I" in "How I Met Your Mother" on the hit sitcom that ran from 2005-2014. Ironically, he also has had a fictional license to practice medicine, on PBS' short-lived Civil War-era drama, "Mercy Street." More recently, the Ohio-born actor was seen on NBC's musical high school drama, "Rise." Radnor's debut on "Grey's Anatomy" airs Thursday at 8 p.m. ET on ABC.